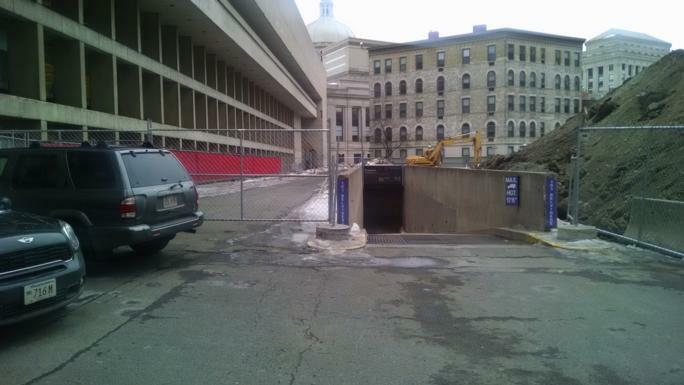 Nestled between the historic walls of the Christian Science Mother Church and the busy commerce of the Prudential Center, a unique underground roundhouse at 7 Dalton St. helped facilitate deliveries to local businesses. Built in 1968, the narrow concrete ramp descended a story below grade, where a tractor trailer would drive down onto a 20 meter diameter steel turntable. The truck could then be rotated to one of several loading docks feeding different buildings. While an architectural oddity, the Dalton St. Roundhouse was long out of use and stood in the way of constructing one of the largest high rises in Boston. Costello Dismantling, working for Welch Corp and Suffolk Construction, began dismantling this substantial underground structure in the Spring of 2015. Our first challenge was to extract the steel turntable itself. The deck, framing and roller system were constructed of heavy structural steel, all coated with lead paint. Costello welders used supplied air and paid close attention to confined space protocol as they cut the turntable up into manageable sections and hauled them to the surface. Following removal of the turntable, cores were drilled in the floor slab to ascertain thicknesses and the condition of the underlying soils. The project team made two discoveries that permanently changed the course of the project: unusual quantities of concrete and unusual amount of groundwater. The project specifications, based on as-built drawings, showed 15” slabs throughout the subgrade level. Actual investigation found concrete thicknesses routinely at 51”. The structure had been massively over-built, with hundreds of yards of additional concrete poured into the heavily reinforced turntable mat. Not only was there this incredible volume of additional concrete, but there were pockets of large voids under several areas, raising more questions about soil conditions and future construction. This discovery immediately changed our demolition approach: to avoid vibration transfer and excess loading on the adjacent Christian Science Mother Church, our work plan called for a saw-cut separation line along the adjacent foundation wall. The turntable mat was now too thick to cut in a single pass, and benching to make two passes would be impossible. If the mat thickness issue wasn’t challenging enough, the cores had also revealed a substantial groundwater issue. Early ground hydrology reports indicated some water in the general area, but nothing under the turntable structure, and nowhere near the quantities discovered. Finally, an asbestos-containing mastic was discovered on the exterior of the ramp walls. The project was put on hold to re-group and develop new approaches. A few weeks later we were re-mobilized with a new demolition plan. Welch Corp had drilled 3 dewatering wells which ran around the clock to manage groundwater issues. Our plan of attack had shifted from saw cutting and dismantling the turntable mat to dismantling the roof slab and entry ramp in two motions: remove roof from West to East, and then return from East to West demolishing the ramp. The entry ramp structure (and its roof) were likewise adjacent to the sensitive Mother Church, and needed to be separated prior to mechanical dismantling. The roof was shored up, painstakingly saw-cut (requiring multiple passes of a 72” saw), then carefully dismantled with a Volvo 480 equipped with a rotating shear. Working 20’ at a time, this process took several weeks. The return trip on the ramp floor was quicker, requiring only saw cutting and hammering with a brand new 14,000 foot pound hammer. While these actions were underway, the team developed an alternate method to structurally separate the thick turntable mat. Instead of using a track-mounted saw, we utilized overlapping 6” core drillings, performed at 5” on center, to perforate the perimeter of the mat, cutting cleanly through the massive slab. It was a laborious process – a single worker could only expect to complete 2 meters per day. Despite the tedious nature of the work plan, nobody in the project team could argue with the results. Our vibration levels never exceeded the carefully monitored limits, the sensitive community — including the landmark church, shopping center, and several hotels — were never unduly inconvenienced by demolition, and truly unforeseen conditions were the only setback in schedule. Costello Dismantling’s contribution to the project was completed with zero safety incidents. The project team now has its sights on construction of a new residential skyscraper that will rival the tallest buildings in the vibrant Boston Downtown. Costello Dismantling is proud to have been an integral part of this exciting project, which demonstrates the vital role of the demolition industry in recovering the underlying value of urban land.